​Our pets are part of the family and our dogs love to come with us on long hikes, camping, car travel and more. You can even stay in hotels that are specifically designed to allow your pets to travel with you. ​But just like travelling with kids, you need to bring all their supplies. But I have found with some research you don't need to pack those large food and water bowls for your trip. You can get collapsible dog bowls or for any pet that travels with you. ​If you love to hike, you can hang them off your backpack or off their vest if they carry their own supplies. There are so many cool products for our pets now that it is much easier to plan a trip. I would keep a small backpack or travel bag ready for those spontaneous trips especially hiking. ​ We take water bottles and snacks for ourselves, we can't forget our dogs need lots of water and snacks too. You can get them their own portable water bottle trough or you can simply bring enough water for the both of you and fill their bowls as you go. These are so lightweight. No more piling some snacks on the ground for them, or trying to find a creek. You can even keep these in your car ready for that next adventure. These wash easily and fold away for safe keeping. You can keep a set in the car, your backpack at the cottage anywhere you need portability and lightweight. If you have a larger dog, these hold quite a bit of food and water. These collapsible dog bowls flatten down and can hang off your backpack or their leash. This style is perfect for the dog park too, so they can have access to water after romping around the fields with other dogs. Dogs need a lot of water so don't forget about them when you head out for hikes. Bring your own water bottle and an extra one for them! This one is completely foldable so you can keep it in your purse or pocket. Easy to clean and easy to carry. You can get it in different sizes. If your dog is used to a bowl to eat or drink from, then this is a good way to go. Not all dogs will drink from streams and sometimes this can be dangerous. If you have access to water, simply fill this bowl for him and let him drink or eat at his own pace. ​If at home you use the automatic dog feeders, then you should have something portable that you can take with you when visiting friends, the cottage, camping, or hiking. Any of the above examples don't take up much room. ​You can also get portable water bottles that are designed for pets that you can hang off your belt. There are all kinds of cool ways to take your dog with you now that don't require a suitcase of supplies. 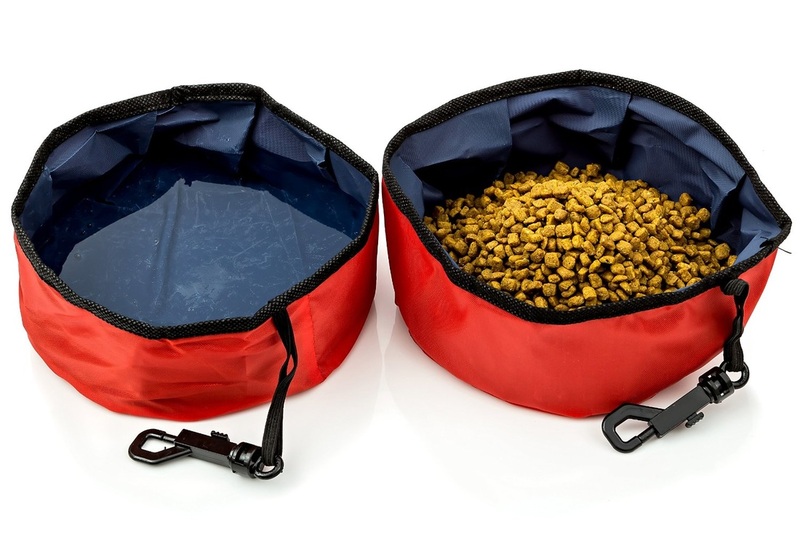 Pack some snacks in your bag for both of you and pack a collapsible dog bowl for his share. It all depends on how long you go for. If it is just for a day of hiking, a few treats and a portable water bowl will do the trick. ​If you have been dragging around that large metal bowl for your dog, you don't need to do this anymore! You don't have to haul around any of your dog's supplies if they are large enough to wear a vest, they can carry their own!. Many dog owners use these for walks, and hikes, and also for training. It has been said they will not pull on the leash when wearing a vest. Not totally sure about the science behind that, but I love the idea that they can carry their own collapsible water bowl, or snacks, or doo doo bags, or even toys to the dog park or for that serious hike. ​If you have a larger dog, this could be the perfect way to carry his things. As long as the things you carry are not heavy this will lighten your own backpack and load. ​You could always keep this packed near the door and ready for any spontaneous hike or walk. Once they have got used to the idea of wearing this, they will associate it with some fun and good times with you.